Russia has vetoed a UN Security Council resolution extending the mandate of a mission that investigates the use of chemical weapons in Syria. The mandate for the Joint Investigative Mechanism or JIM is due to expire mid-November. Russia says it wants to consider the work of the mission and whether it is still needed after it reports this week on an alleged gas attack on an opposition-held town in April. “The resolution is intended to once again show up and dishonor Russia. But I want to be absolutely clear today’s decision will in no way have an impact on the future of the JIM (Joint Investigative Mechanism) the way it has been functioning, or will function until November 17 and it will continue to operate anyway,” Russia’s UN Ambassador Vassily Nebenzia told the Security Council. “The United States deeply regrets that one member of this Council vetoed against this text, putting political considerations over the misery of Syrian civilians who have suffered and died from the use of chemical weapons”. After the vote Mr Nebenzia said the elimination of chemical weapons in Syria had nearly finished casting doubt on the need for the mission to continue. The JIM is due to report on Oct 26 on who was responsible for using a deadly nerve agent which killed dozens of people in the town of Khan Sheikhoun. 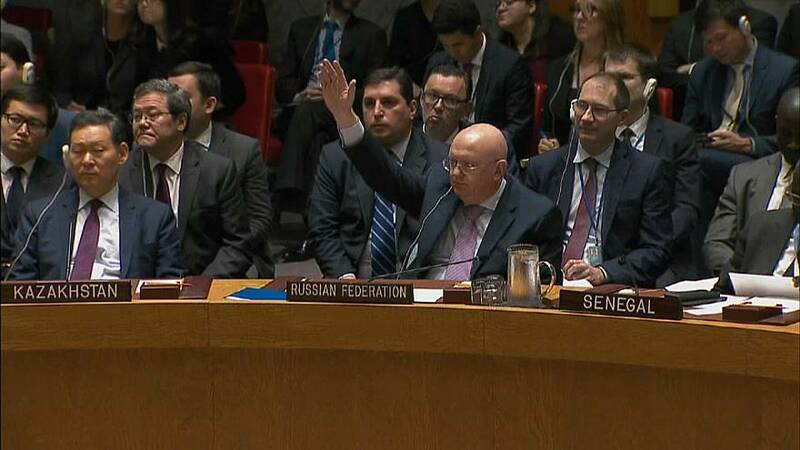 Russia which is an ally of President Bashar al-Assad has rejected a separate UN report blaming the Syrian government. It says ISIL chemical stocks probably exploded in airstrikes.